The best of drunken ideas can turn into solid gold for musicians willing to step outside their comfort zone. Soilwork vocalist Björn ‘Speed’ Strid and fellow guitarist David Andersson initiated plans for a classic rock band back on the long road trips in 2007 – an act that would travel in a literal and fictional sense to take you on adventures of special proportions. Enter The Night Flight Orchestra – which also includes Arch Enemy/Spiritual Beggars bassist Sharlee D’Angelo, keyboardist Richard Larsson, and drummer Jonas Källsbäck. Their debut album Internal Affairs from 2012 brought back memories of late 70’s Kiss, Bob Seger, and Steely Dan among others, very catchy, groovy, and filling my head with loads of memorable, good time tunes. So expectations are on high that Skyline Whispers will continue the fun factor for TNFO and their fans. Be aware right from the start – there is no metal to be had in these 13 tracks, although there are a lot of 70’s bluesy root guitars, Deep Purple-like organs, and larger than life chorus hooks that make “Sail On”, the funky “Lady Jade” and “Demon Princess” sure-fire winners upon initial exposure. The keyboard and guitar tandem riff for “Living for the Nighttime” appears to have a lot of similarity to Kiss’ “I Was Made for Loving You” meets the J. Geils Band’s “Come Back”, while Björn settles into that power melody comfort zone to carry the chorus to the cranium. The almost 10 minute “The Heather Reports” has an exploratory feel, the band members feeling free to build off certain chord progressions in a laid back manner a la early Whitesnake, Fleetwood Mac, and the aforementioned Steely Dan before picking up dramatic progressive/bombast rock steam. 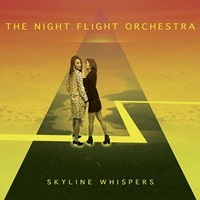 Unafraid to incorporate difference makers from dialogue of a boyfriend/girlfriend nature, ambient feedback/drum loop oriented instrumental work, or hand claps, The Night Flight Orchestra take into consideration all aspects that made this 70’s/80’s sound so magical. Favorites change from day to day – the early Toto sounding “All the Ladies” and aforementioned “The Heather Reports” topping my headspace currently. Even the color scheme, clouds, and females that adorn the cover fall right in line with the band’s plan – entertaining in adequate tribute to their favorite yesteryear acts. When done correctly, the fans benefit as equally as the musicians for a side project. 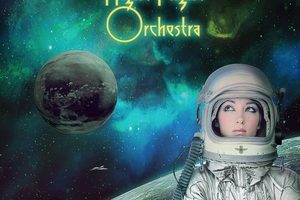 Open minds and classic rock fans unite as The Night Flight Orchestra registers another groovy home run.